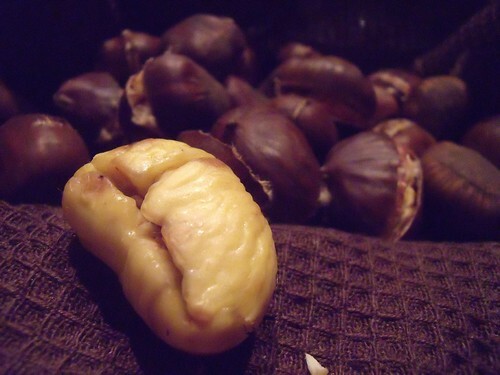 So I found some uncooked and unpeeled chestnuts at the grocery store, and wanted to roast some myself, which I knew I could do in the oven after reading a post by my favourite Knitting Humourist (yes, that’s a job! Don’t you want it? ), the Yarn Harlot. Hazan’s instructions start with soaking the nuts, then cutting them horizontally, then roasting in the oven, wrapping in a towel to steam, and peeling to eat! I can do that! And so I did! Now I share them with you! 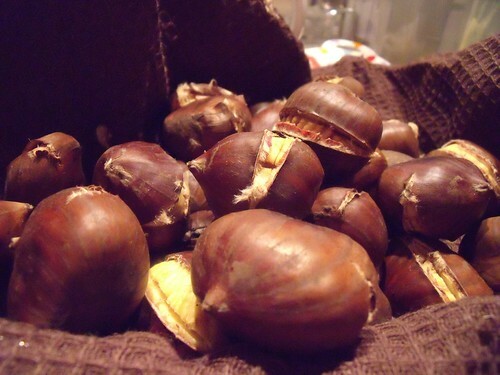 Soak unpeeled chestnuts in lukewarm water for 20 minutes. Then drain. Make a horizontal cut in each chestnut around the bulging side of the chestnut. 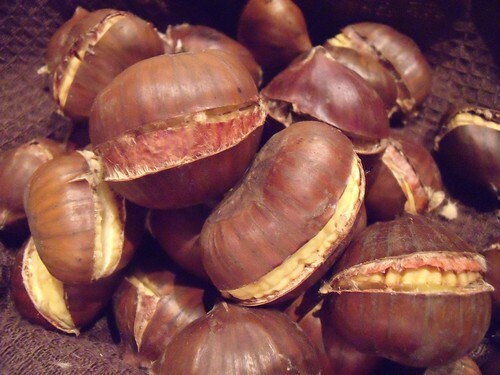 Don’t cut into the flat side of the chestnut or too deeply so that you cut into the nut “meat” itself. Place the nuts, cut-side-up, on a baking sheet. Roast at 425 for 20 minutes, or until the nut “meat” softens and explodes through the cut shells. Pop the nuts into a clean dish towel, and wrap up tightly to steam for 10 minutes. This will help to remove the shells and skins. Let people peel their own nuts, removing shells and fuzzy skins. 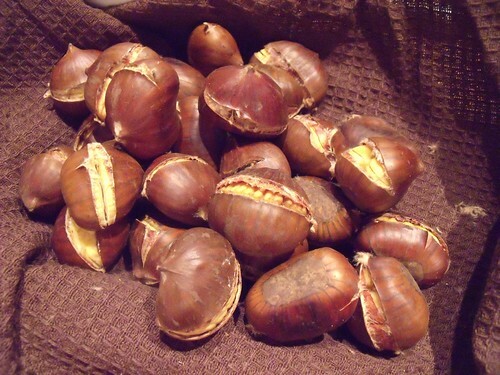 If you’ve cut a little too deep and into the “meat”, your chestnuts will look a bit like grumpy old men. Very cool, Linz…thanks!!! I have often wondered just how it’s done & how they are peeled, after listening to the Xmas song lol….Hugs!